The .travel gTLD, which was approved 10 years ago, will have to support the Uniform Rapid Suspension service, one of several significant changes proposed for its ICANN contract. I believe it’s the first legacy gTLD to agree to use URS, which gives trademark owners a way to remove domain names that infringe their marks that is quicker and cheaper than UDRP. Tralliance, the registry, saw its .travel Registry Agreement expire earlier this month. It’s been extended and the proposed new version, based on the New gTLD Registry Agreement, is now open for public comment. While the adoption of URS may not have much of a direct impact — .travel is a restricted TLD with fewer than 20,000 names under management — it sets an interesting precedent. IP interests have a keen interest in having URS cover more than just 2012-round gTLDs. They want it to cover .com, .org, .net and the rest too. Domain investors, meanwhile, are usually cautious about any changes that tilt the balance of power in favor of big brands. When .biz, .org and .info came up for renewal in 2013, the Intellectual Property Constituency filed comments asking for URS to be implemented in the new contracts, but the request was not heard. I’m aware of two ccTLDs — .pw and .us — that voluntarily adopted URS in their zones. Other changes include a requirement for all .travel registrars, with the exception of those already selling .travel domains, to be signatories of the stricter 2013 Registrar Accreditation Agreement. That’s something Afilias and Neustar only agreed to put in their .info and .biz contracts if Verisign agrees to the same provisions for .com and .net. The fees Tralliance pays ICANN have also changed. It currently pays $10,000 in fixed fees every year and $2 per billable transaction. I estimate this works out at something like $40,000 to $50,000 a year. The proposed new contract has the same fees as 2012-round new gTLDs — a $25,000 fixed fee and $0.25 per transaction. 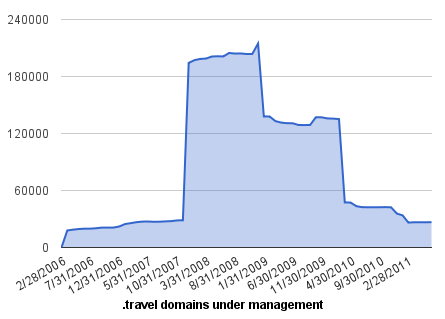 The transaction fee only kicks in after 50,000 names, however, and that’s volume .travel hasn’t seen in over five years. Tralliance will probably save itself thousands under the new deal. The contract public comment forum can be found here.